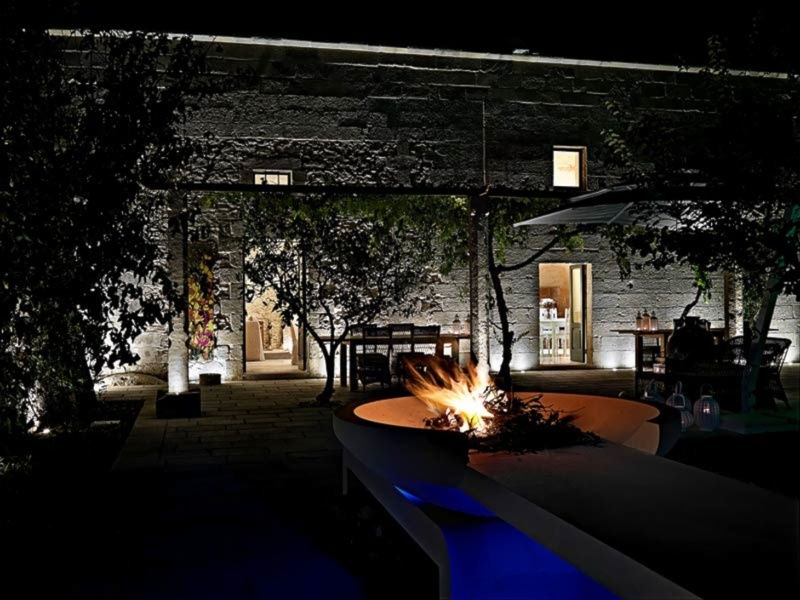 Relais Masseria Capasa is a Manor Farm in ancient Martano, Italy. 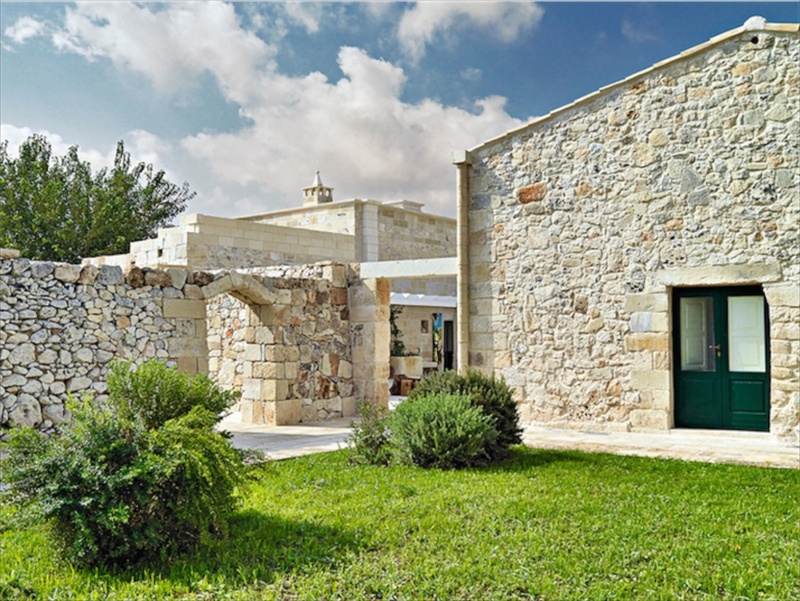 The farm, which I will refer to in the abbreviated Capasa, is a place rich in history, built in 1746 and renovated in 2013 by architect Paolo Fracasso of Porto Viro, Italy. 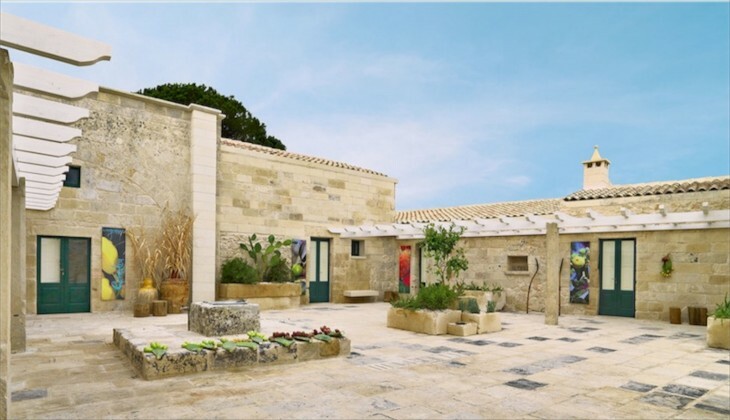 Owned by various families throughout its life, the property fortunately fell into the hands of Earl Charles Gaetani. Mr. Gaetani achieved this beautiful restoration using his own funds. His coat of arms are carved on the pillars at the entrance to the property. 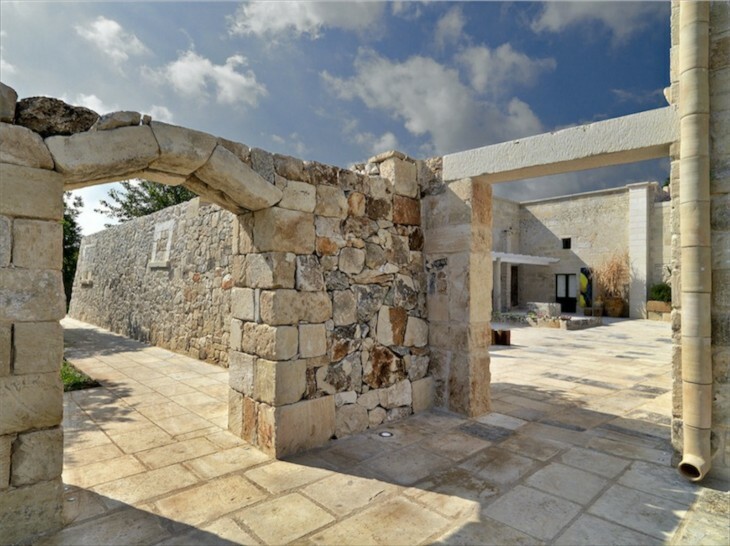 The restoration is sensitive yet respectful of its origins; modern, yet with an exquisite balance of new and old. 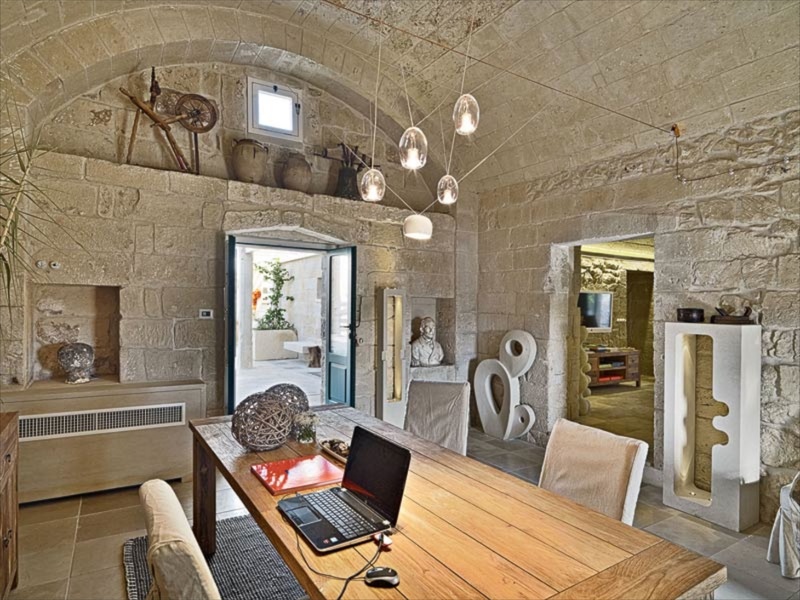 The architect managed to balance old world with comfort and without any residue of stuffiness. 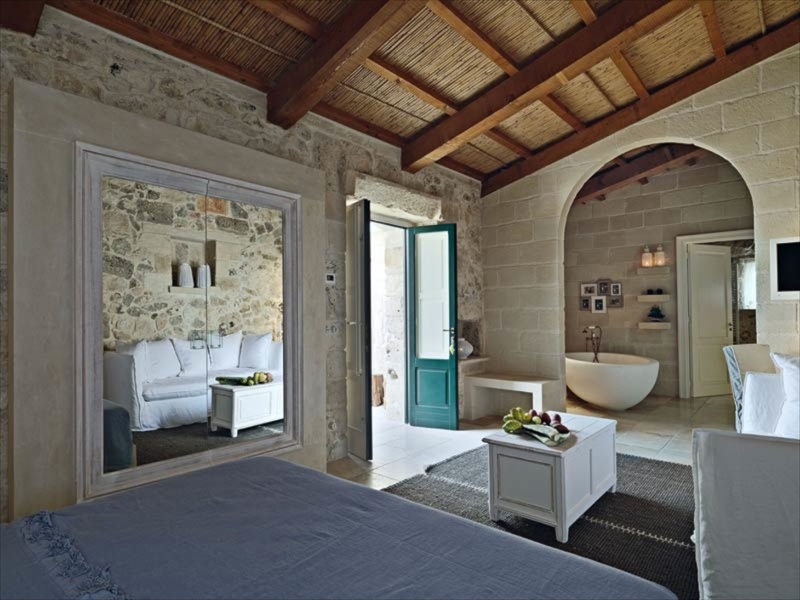 The home is at present available for private family gatherings or events, with three deluxe bedrooms and three deluxe suites. I was able to get additional photos that show exterior shots as well as the interior decor. So here we go, a mini view of what a vacation in southern Italy might hold in store for our comfort after touring the ancient and historic areas. The rooms and suites have names so I will use them to make it a bit easier to follow, but first, here are a few exterior photos. 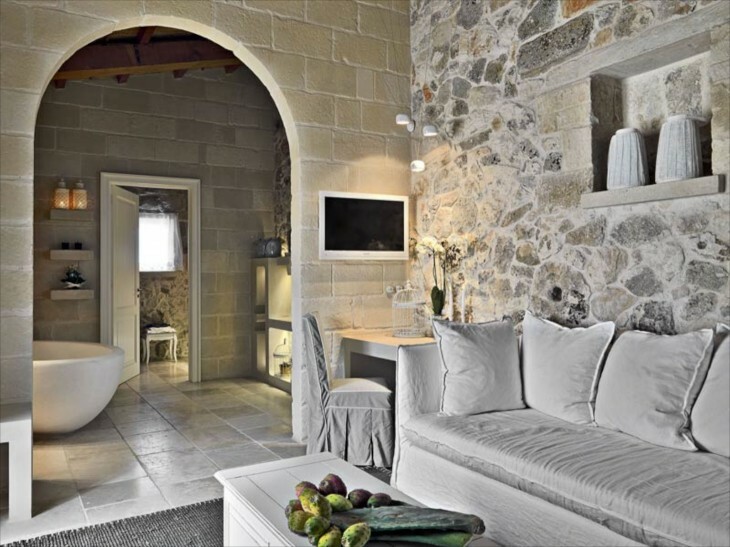 The rooms or suites all open directly onto a stone courtyard. 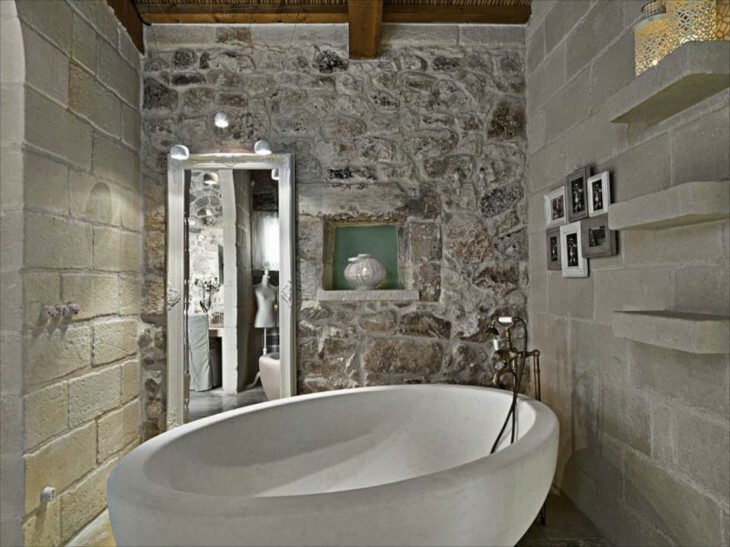 The colorful art on the stone walls is repeated in the rooms throughout the house. The light seems to touch every corner. 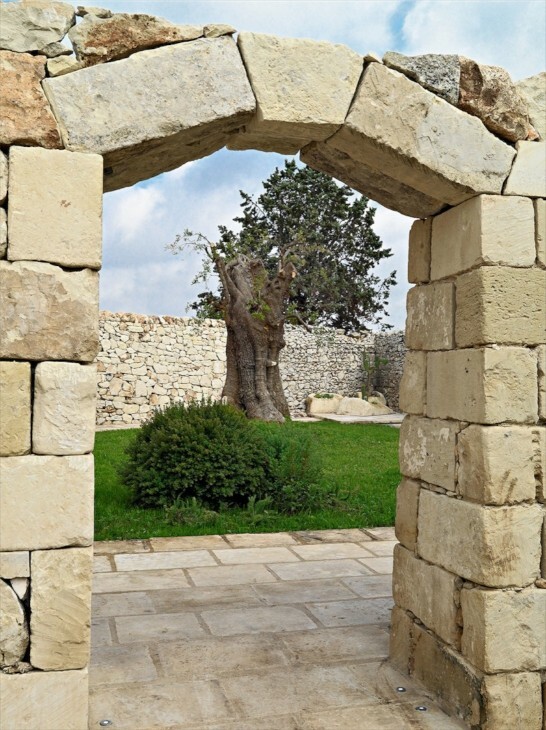 An ancient fig tree holds prominence in a grassy part of the stone walled courtyard. All the stonework appears to be set without mortar. Stonework is an art, and this farm will show you the exemplary work of the stonemasons. From another angle you can see the intricacies of the stone work. To the right you can see that even the gutters are stone. An ancient artifact remains. Look at how seamlessly the large stone merges into the more random pattern of the smaller stones. On top of that, these walls, if you noticed above are not straight up and down, but set like piers, wider at the base than at the top. 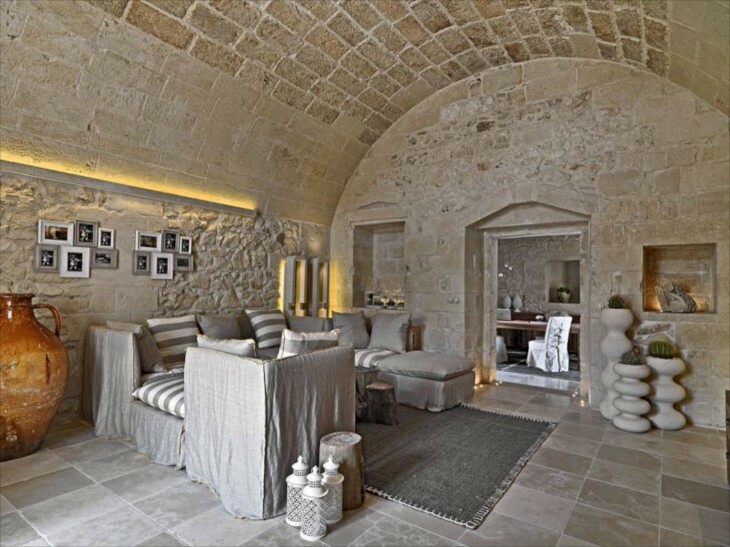 You can see a couple of lights set in the stone floor, washing the walls with light at night. Rustic wood beams and ceiling finishes add additional organic elements, while the headboard, in simple white adds a modern twist as do the two tables and simple but whimsical decor. 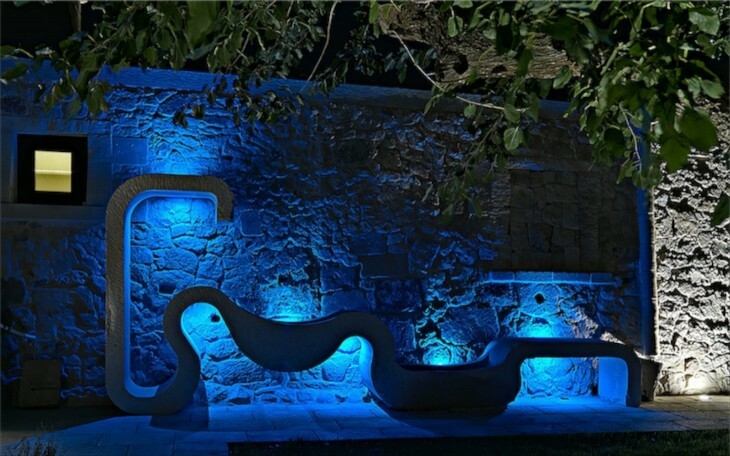 I love how the architect, Paolo Fracasso has used lighting as a major design element throughout the reconstruction. Here it is used to amplify the green overmantel of the fireplace, and in the small niche that also shares the same green, setting off two modern pieces of pottery. Although I am not wild about the loos, I like the rest of this bath. 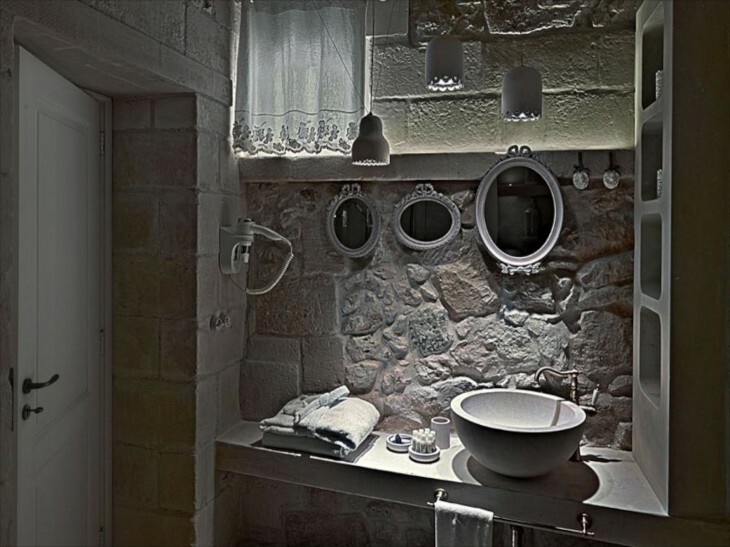 Notice the small modern clear lights above the mirror. 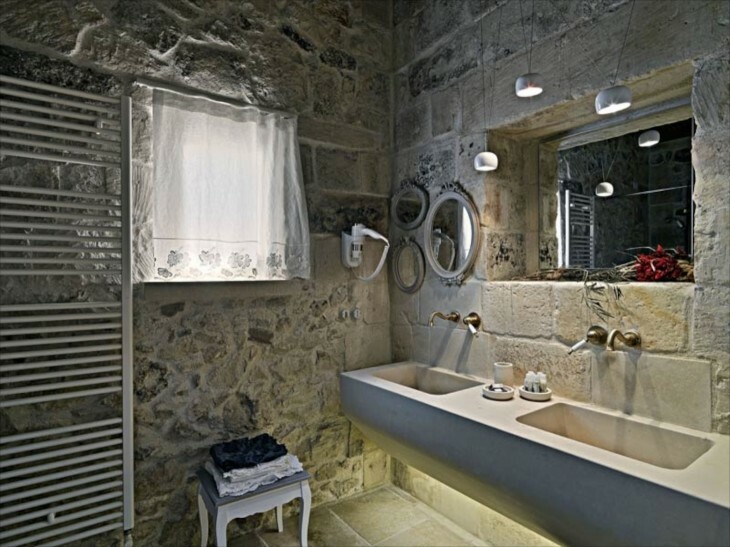 There are also lights beneath the massive stone sink top that brings attention to the limestone floors. 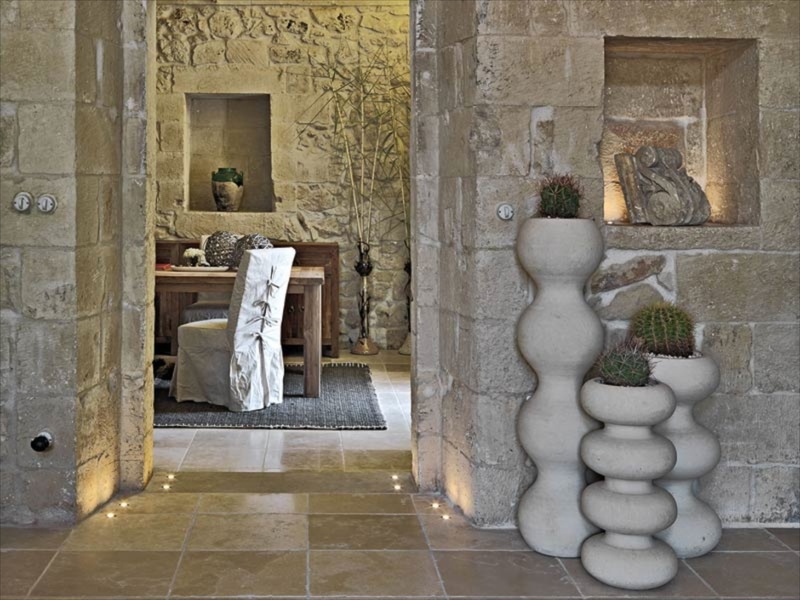 Honed limestone looks “soft” and is a nice contrast. Notice the shower through the barely visible glass divider. 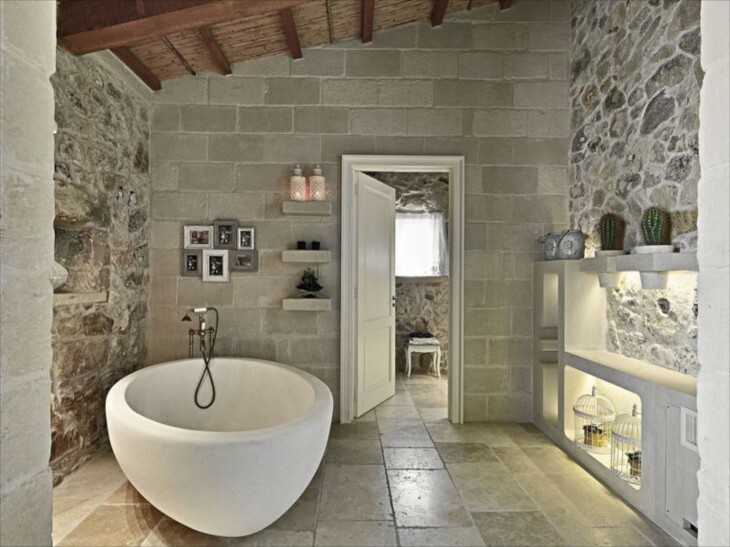 On our horse farm I specified old brick for my shower walls and it was sealed and surprisingly easy to keep clean, so I am assuming the same for these stone walls. A clean lined canopy bed in white is perfect, tiring in with the white linen and white trim elsewhere in the bedroom. 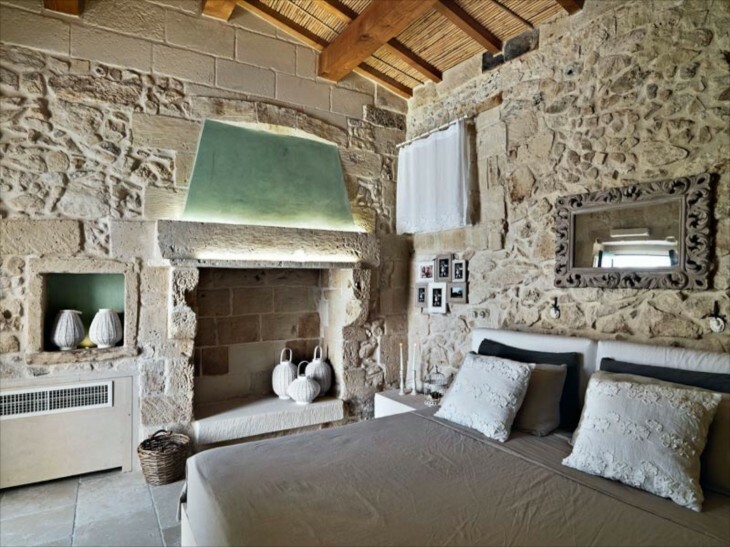 I like how a trio of sconces wash the walls with soft light. At the head of the bed and to each side are tiny pin lights, and a brightly colored piece of art (like in the courtyard) brings a dash of color. 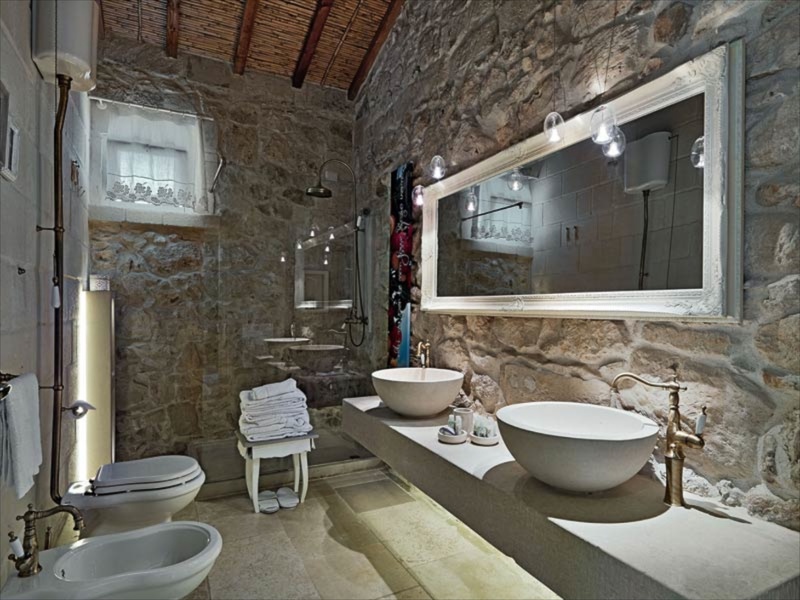 In this bathroom a trio of mirrors mimics the shape of the sink, while a trio of modern lights, each different, provide overhead lighting. 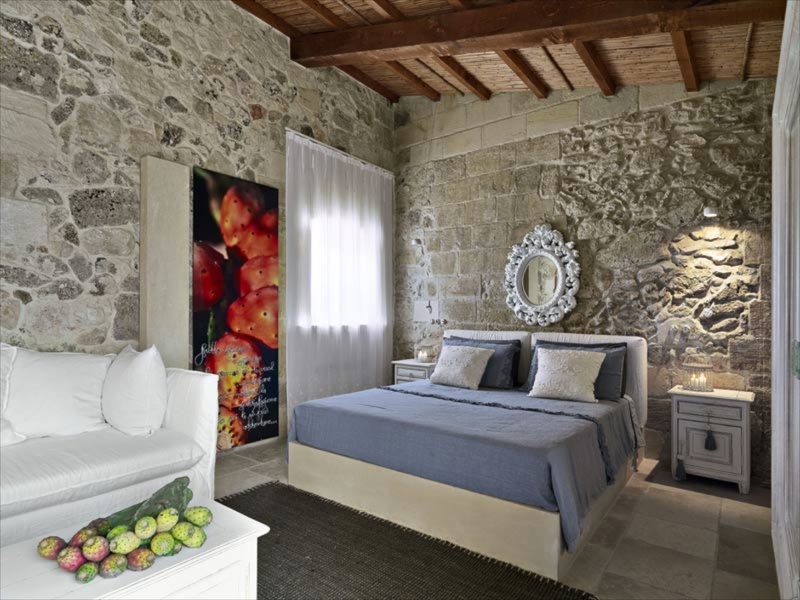 The same simple white linens cover the windows throughout the farmhouse. Another piece of art in this bath provides the only color. 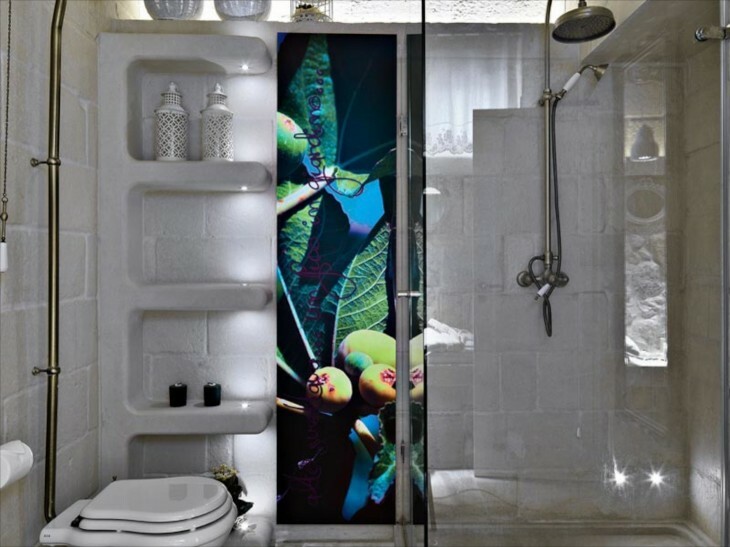 It is hard to see, because a door is reflected in the glass, but a large shower has a wonderful brass rain shower head with lighting near the floor as well as uplighting above. In this suite, you have to love the barrel vault that is comprised of not just brick, but stone rising to meet the brick. Lighting again subtly emphasizes the beauty of this feature, and the wall niches. I love the use of a modern interpretation of a wine jug (a giant sized one!) to the left, which is shiny in complete contrast to the surfaces all around it….a needed visual relief. 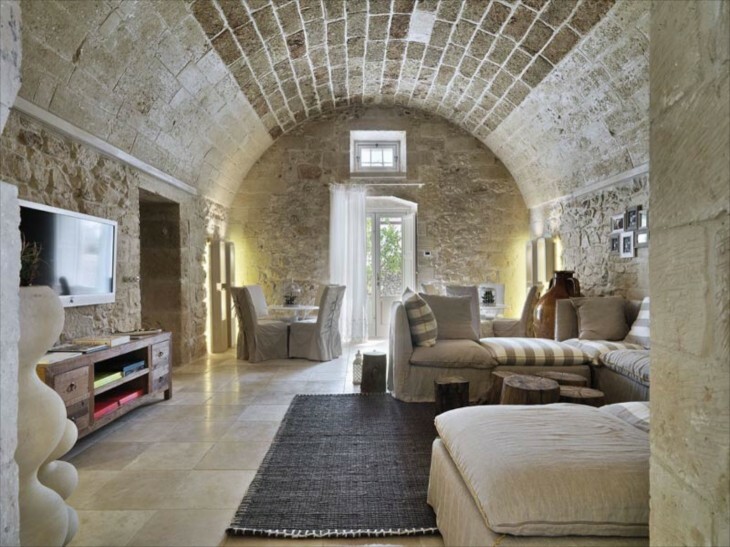 The lanterns by the linen covered sectional (notice the addition of a few striped cushions and pillows) and the trio of modern planters against the wall offer interest in their patterns and shapes . The total effect is quiet, elegant, yet simple. 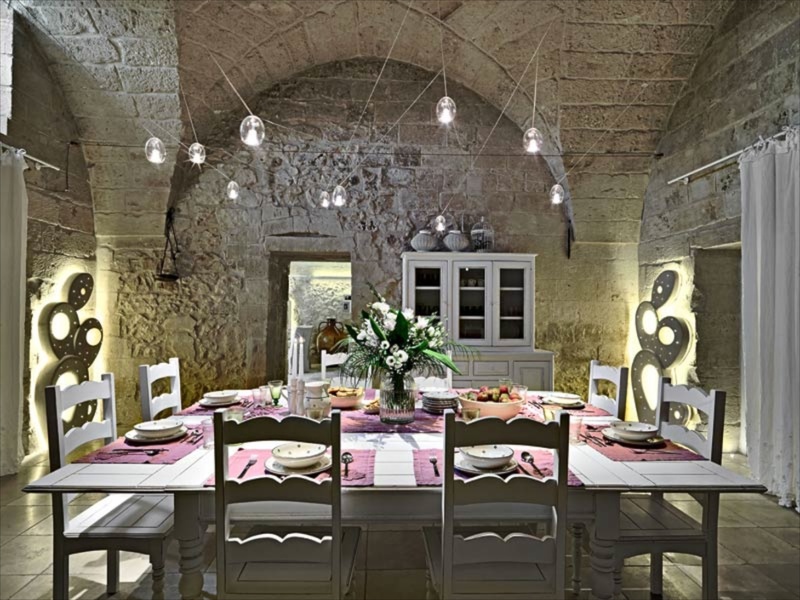 Your eye follows the axis through the door into the dining area. Beautifully scaled and proportioned room. I love this room because it says ” come in, sit down and enjoy yourself. ” The ceiling here is gorgeous! The modern lighting above a country table and chairs, with the room accented further by a pair of modern sculptures providing addition lighting works to provide a sensible and lovely ambiance. I am sure the meals are wonderful, as this part of Italy, though dry, is one of the largest agricultural producers in the country, offering artichokes, tomatoes, mushrooms and olive oil, and is known for their cuisine. Here is another view of the sitting area from a couple of photos back. It is a bright room despite few windows and doors. The courtyard area right outside the dining room from above. I can almost feel the breezes from the cool evening air slipping throughout the dining room seen throughout the courtyard doors. 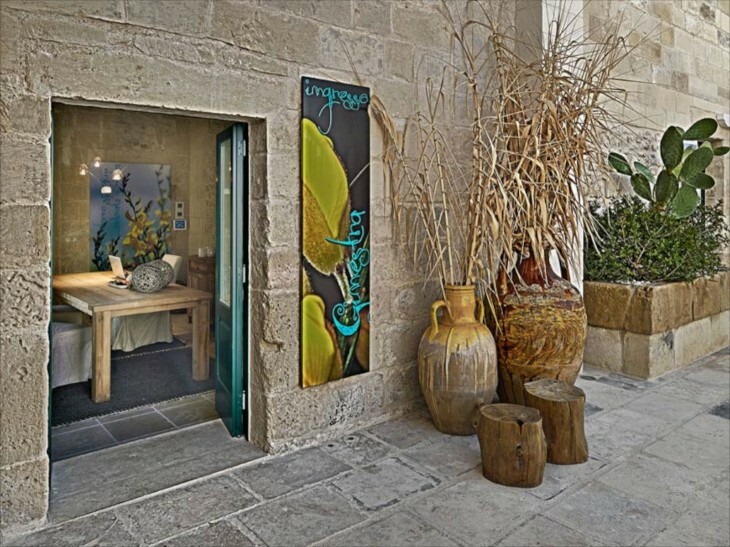 Here we see the bright artwork repeated in another area of the courtyard right outside another suite of rooms, this view looking into the dining room, seen in the next photo below. 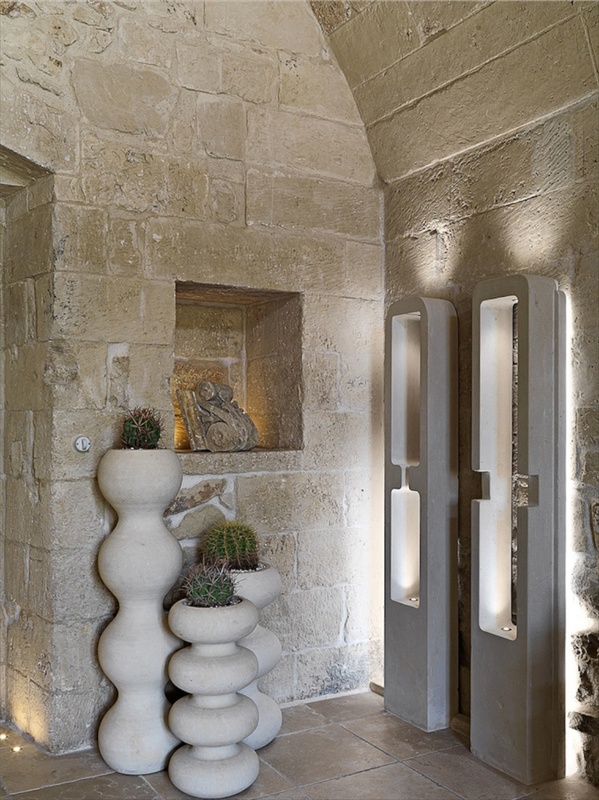 Notice the tiny accent lights along the floor in the hallway, and in the niches. Even if you are not a fan of modern, how could you not appreciate the design of this kitchen? The juxtaposition of new and old is brilliantly balanced in the elements that make for symmetry between retention of the rustic of old, and the modernity of new. 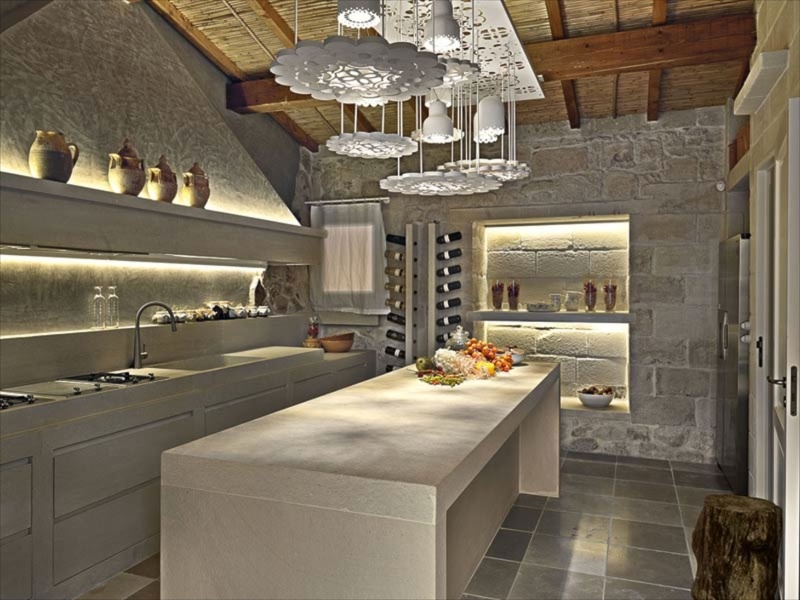 The smoothness of the island, extending down the side, is a perfect foil for the stone and wood. This room feels warm, in no small part, due to the lighting. It is wonderfully layered. The cactus is perfection for these planters. Another view of the kitchen, and a repeat of the colorful artwork, providing a burst of color….. just enough color. So interesting to see how Fracasso played antiques against modern. In this room we see the contrast of the antiques on the ledge foiled by the modern sculptures on the floor. The computer makes a statement in this beautiful and very old farmhouse room. I like the stone pediment above the door leading out to the courtyard. A large fire pit bids welcome to visitors. A good glass of wine, some nip in the air….what more could one ask for? The last bedroom, this one with a tiny bit more color, with fruit and art. 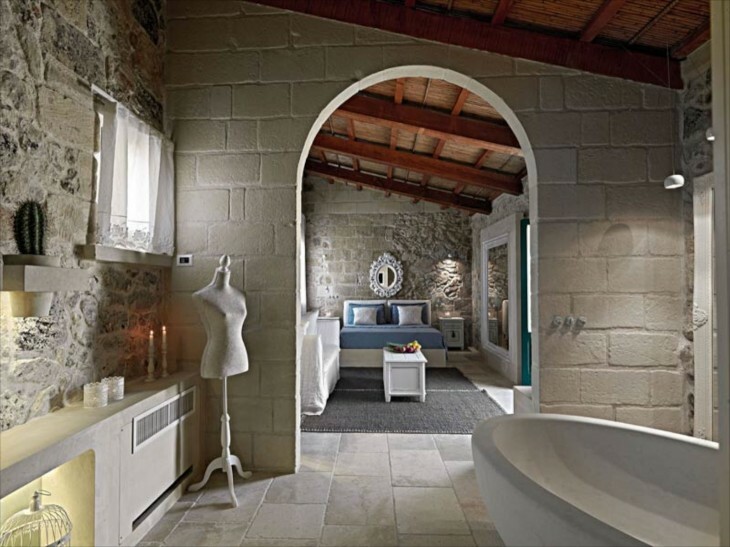 A view back into the bedroom from the bath. The curve of the tub, and it’s placement on the diagonal, compliments and mimics the arch of the doorway. So organic, yet not in the least bit cold looking. There are those small lights again, their effect amplified by the mirror. Just a pop of color in the niches. Full view of this suite. Fracasso used repetition throughout. Here we see an example of the three mirrors, used in another bath. Even the single pear on the tree acts as living art in the courtyard. An ultramodern sculpture with blue lights perfectly placed to emphasize its sleek curves in contrast to the texture of the stone wall behind it. Daylight again, and an opportunity to spend another day in Italy. I’m game! The restoration of this home/inn appealed to me because it is very difficult to take old and be able to achieve a harmonious balance when decorating. Often either the architecture dominates, or the decor competes with it. It is a delicate balance, and I think this restoration achieved it beautifully. This region of Italy is in the heel of Italy, about 20 minutes to the Adriatic sea. An ancient town, Martano is rich in archaeological sites. It has a population of just under 10,000 people, so is easily navigated. If you enjoy cuisine, it plays a very important role in this city, as it does in many parts of the country. Loved this post. Love all your posts. Thanks! Thanks Judy. This is one home I fell in love with as soon as I saw it. It is unique in how it is a perfect balance of old and new. 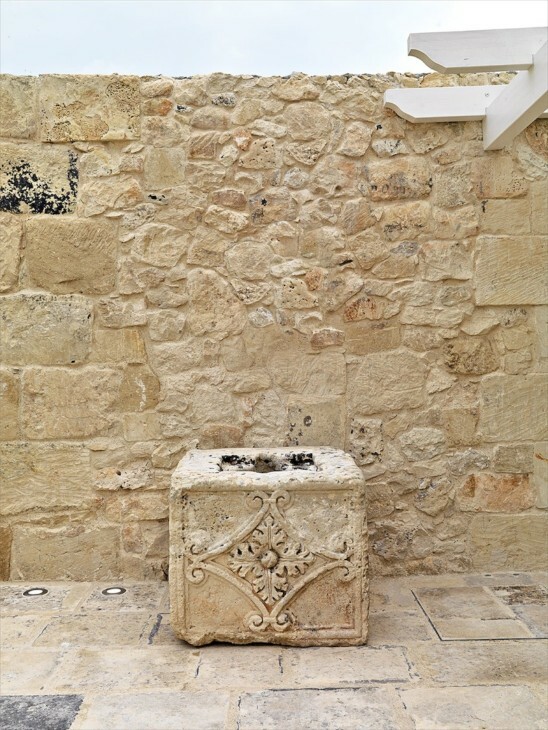 I love stonework, and the restoration and new stonework here is amazing. Thanks for taking the time to comment. I fell in love with this restoration as soon as I saw it. Wonderful balance of new and old. A very respectful restoration. Oh my goodness, was I transported back when I saw these beautiful pictures! Makes me want to change my upcoming trip and go back to Italy. I can’t begin to tell you how many restaurants I ate in, that had the barrel ceiling just like what was pictured here. I’m thrilled that you are back. I’ve missed the blog, it became part of my morning. A cup of coffee, wonderful writing and pictures. Thanks ever so much for all the time, effort, and love you put into this. I bet you were transported back to Italy, as you had such wonderful memories of that trip! 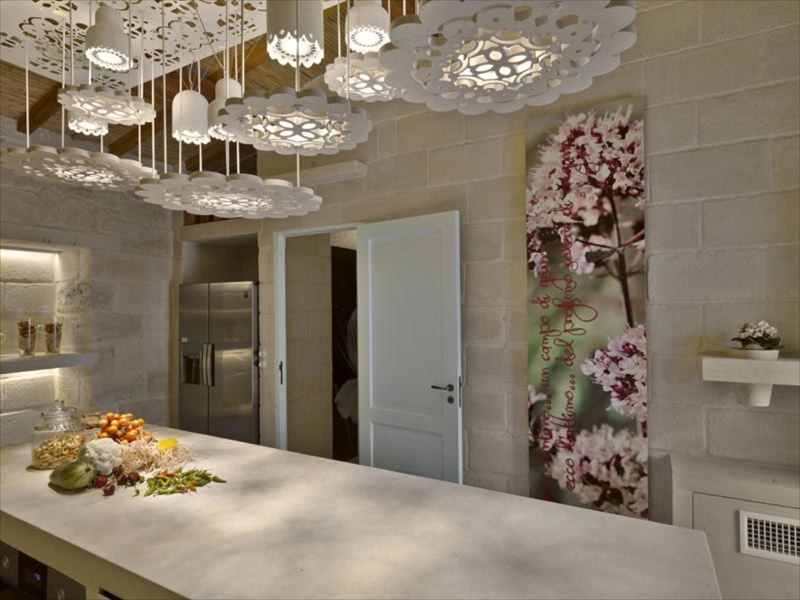 I love, love those ceilings and can’t wait to see them myself in person. 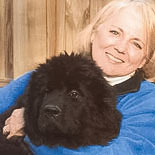 Thank you so much for your support Carole, and the compliment….made my day. I could easily live in this home, only thing I would add is about 6 dogs and a couple of cats and maybe a Burro for the courtyard. Wouldn’t this be a great place for all of us to have Thanksgiving dinner? Oh, I could so live there! Wouldn’t it be fun for a holiday? Already added to my bucket list. So glad you are back!! Loved this post! Wish this was run as a hotel. It would be a wonderful place to stay.